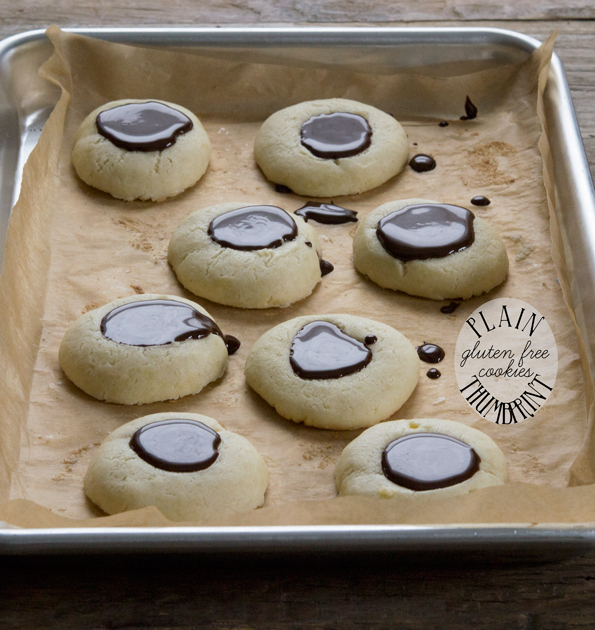 Plain Gluten Free Thumbprint Cookies with Chocolate Filling | Great gluten free recipes for every occasion. I have thumbprint recipes all over the place, to be honest (my first book, my second book, even a chocolate one on this blog), but I was still antsy about the thumbprints. I wanted a solution to the disappearing thumbprint once and for all—one that allowed us to fill the print after baking. You can imagine the failed buttery cookies my family has eaten over the last couple weeks. Up until now, my best solution was to bake the cookies for 5 minutes, press a thumb (or more likely a 1/2 teaspoon), fill, and then finish baking. Not bad, but what if you don’t want to bake the filling, like, at all?! Well well well. Well. And that’s it. I rejiggered the recipe so that it’s a bit lighter and fluffier, which helped the print stay in place. And then I even used some insurance in the form of … pie weights. But the pie weights really aren’t that necessary. The balance of ingredients in this recipe really takes care of the problem on its own. But still, I’m a big believer in insurance. I always consider it money well-spent, and if I don’t ever cash in? Good for me. 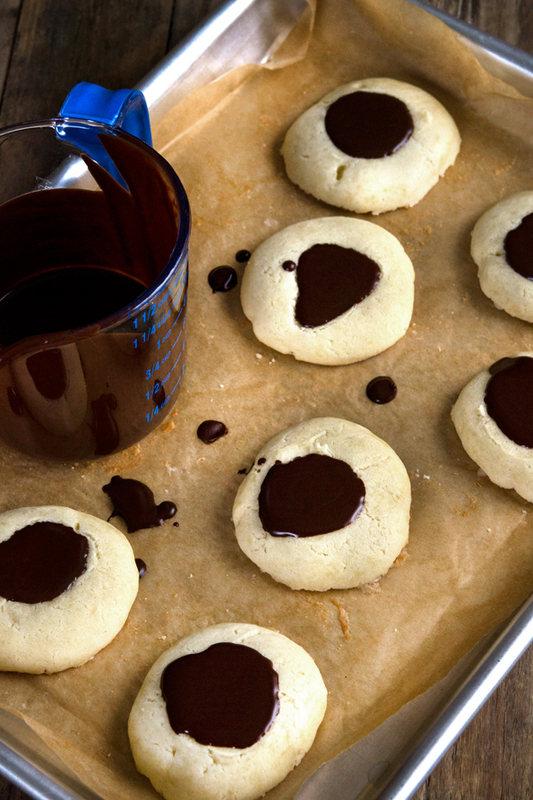 You are hereby free to fill these thumbprint cookies with whatever you like. I filled it with a very stable mostly-chocolate mixture, but you could totally fill it with a chocolate ganache. Or even candy! How cute would that be?! Maybe even some marshmallow fluff? That stuff makes me weak in the knees. How about Jello, for something of a stained glass effect? Go for it!! Cookie Season, we’re ready for you! In a large bowl, place the all purpose flour blend, xanthan gum, cornstarch, salt and confectioners’ sugar, and whisk to combine well. Create a well in the center of the dry ingredients, and add the butter, egg and vanilla, mixing to combine after each addition. The dough will be thick but soft. Divide the dough into 12 equal pieces. Roll each into a ball, and then flatten into a disk about 1/2 inch thick. Press the moistened bowl of a 1/2 teaspoon (or your thumb, moistened) into the center of each disk, about 3/4 of the way to the bottom of the dough. If the dough begins to stick to the teaspoon or your thumb, moisten it in between each cookie. To ensure that your divot remains after baking, you can place a small piece of unbleached parchment paper in each divot, and top with a couple dried beans or pie weights. 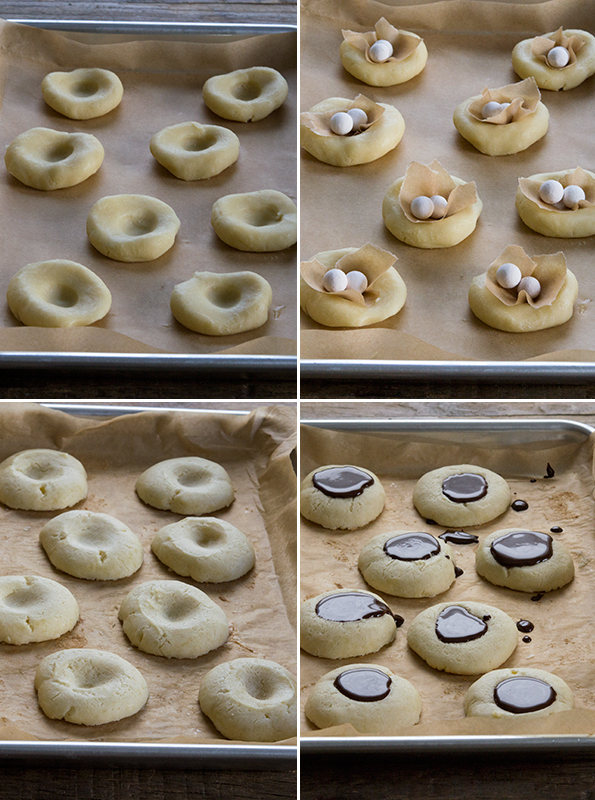 Place the cookies in the center of the preheated oven and bake for 10 minutes, or until the cookies are puffed and set. They will only brown a bit around the edges. Remove the cookies from the oven, allow to cool for about 5 minutes on the baking sheet, and then remove the weights and parchment paper (if you used them). Transfer to a wire rack to cool completely. 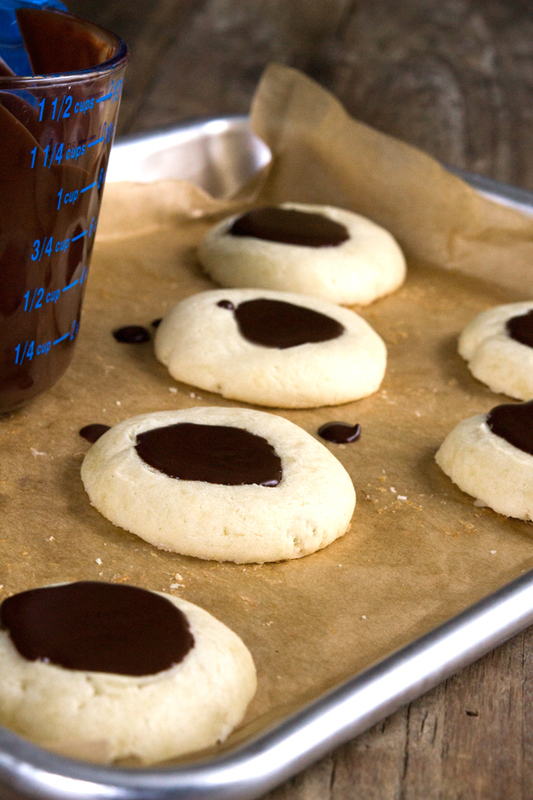 While the cookies are cooling, make the chocolate filling. Place the chopped chocolate (or chips) and the shortening in a small, heat-safe bowl. Place over a small pot of simmering water, taking care to ensure that the bowl does not touch the water. Heat, stirring occasionally, until the mixture is melted and smooth. Remove from the heat and allow to cool for about 5 minutes or until it just begins to thicken. Pour into the wells of the cooled cookies and allow to sit at room temperature until set (about 45 minutes). If you’re in a hurry, place the cookies in the refrigerator to speed things up a bit. P.S. Thank you so much for all your support of the new book, GFOAS Bakes Bread! Last night’s Live Facebook Q&A was awesome. You were out in full force! I hope it helped ease your concerns about baking yeast bread. And we’ll totally do it again, maybe next week if you’re into it! Yay! Another recipe I was REALLY missing from my gluten days. Me and my kiddos are making these, tonight, with a (baked) jam filling – 1/2 apricot and 1/2 raspberry. Can’t wait!! Just made these and they are sooooo good! Most of the GF recipes I have tried (from other sources) turn out gummy…not yours! I am going to have to take them to work tomorrow so I don’t eat all of them! THANKS!! Absolutely brilliant!!!! Now why didn’t I think of that??? You are so awesome Nicole!!! And I LOVE the bread baking book!!! Can’t wait for my foot to heal so I can dig right in!!! I just want to say that I love your blog, your recipes, and YOU! We have very recently become a Gluten Free (for me), Dairy Free (for my husband and me) home and we’ve all loved every single recipe of yours that we’ve tried. My children (4 & 8, both girls) don’t even mind being gluten free and dairy free because they love trying out your recipes with me. At the moment, I am enjoying a very warm three ingredient chocolate cake that is absolutely delicious. I cannot thank you enough! Nicole, My family loves me to make Oreo truffles. Do you think your “Thin & Crispy Chocolate Wafer Cookies” would work? If so, how long do the cookies ‘survive’ before they go stale? Or would it not matter with them crushed and mixed with cream cheese? My bread book came and it’s in black print. Thank You whoever is responsible for it. Oh, I love these! I feel like so many thumb print cookies are peanut butter, so I love a good buttery cookie instead, especially one filled with chocolate! Nicole, I am making the cheesecake cookies for a cookie exchange here at work (my family will be able to eat the cookies I bring home). Since I have to bake the night before, how should I store them when baked? I missed the Q&A last night but read through everything that was posted. What a great discussion! I can’t wait until my expandex gets here today and I can get some starters going. These cookies are awesome looking – you could even pipe in some frosting with a star tip into these little guys – we are all pretty found of nutella cloud frosting around here and I bet they would be great! Thank you for all that you do to make GF normal! Jennifer, Nutella Cloud frosting??? Oh please do share the recipe with us! I would like to make these with that as part of a Christmas gift. You got it Mare: http://www.crumbsandchaos.net/2013/02/nutella-cloud-frosting/ – FYI: I use 1/2 c of the nutella – it just tastes so much better that way but can a little more airy, if that makes sense?